The use of cryptocurrencies like Bitcoin may have been denounced by some countries, but the underlying technology behind these cryptocurrencies, i.e Blockchain has been widely accepted all over the world. And why not? It is by far the most innovative cryptographical method which is probably the most secure medium for storing user data. 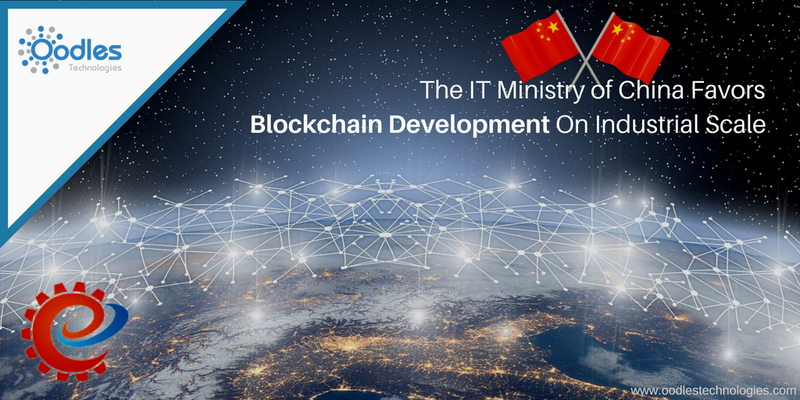 As it turns out, the deputy director of China’s Ministry of Industry and Information Technology (MIIT) spoke in favor of fostering the use of Blockchain as a core technology to make China a new digital economy. According to a post on MIIT’s official website, the Deputy Director of MIIT has urged the Chinese government to unite forces to foster the use of Blockchain for improving the digital economy of the country. While speaking at the National Expert Forum 2018 on Manufacturing Powerful Countries, the Ministry’s deputy director, Xin Guobin specifically emphasized the role of Blockchain technology in various global industries. He further accentuated that the Blockchain technology should be grasped from a strategic perspective. Also read Using Blockchain Can Do Wonders In Education Sector. Blockchain is a publically shared distributed ledger which is comprised of a series of electronically interlinked blocks (also known as records) that are used to store user data. In this way, it forms an extensive network where Each block in the network stores a small patch of data depending on the assigned size limit. In other words, Blockchain creates an immutable, tamper-proof and pseudo-transparent decentralized digital ledger which isn’t controlled by any third-party or central system. Perhaps, the greatest advantage of Blockchain is the extent of flexibility and adaptability it offers to the users. While initially it was built to be used within the Cryptocurrency domain for recording and facilitating transactions, Blockchain has now become popular in many other industries such as FinTech, Retail, Commerce, Healthcare, Insurance, and Real-estate. Given below are some key benefits of the state-of-the-art Blockchain technology in Development. Blockchain offers a high level of transparency to the stored data (or transactions). For example, if a transaction happens at any node within the Blockchain, it is visible to every other existing node. In this way, if there happens to be any malicious activity in the network at any point of time, it can be easily detected and necessary steps can be taken to avert the risk. Blockchain is possibly the most secure database ever to exit. Not only does it offer an optimum level of transparency to the transactions and other stored information, it also secures the data with the most advanced form of Cryptography. The Data stored on a Blockchain-based ledger can never be deleted or modified; it remains there permanently as a digital ledger. The use of Blockchain saves you from a lot of paperwork which is not only time-consuming but is also prone to errors. The ordinary process also requires a third-party or intermediary which makes the process even more complex and time-consuming. Since you don’t have to deal with any third-party, intermediary or central system, it brings a substantial reduction in operational costs. You may also like TRAI Proposes Use of Blockchain To Counter Telemarketing Spams. As it turns out, the Chinese government imposes stringent laws on the use of decentralized digital currencies with a negative outlook towards domestic crypto trading. However, on contrary to this, the country seems to be quite affable towards the use of the underlying technology behind these digital currencies i.e Blockchain. A few months earlier, the Chinese president Xi Jinping spoke highly of Blockchain calling it “a new generation of technologies that are reshaping the global economic structure. And now with Mr. Xin Guobin speaking in favor of this digital ledger technology, it seems like the Blockchain technology is likely to have a mass adoption in different Chinese industries in the near future.